JACKIE O’CONNOR has seen the first ten minutes of many DVDs. After that she often nods off, not surprising given that her day usually starts while most of us are still waiting for the alarm to go off. Jackie and her husband Joe O’Connor, ‘Joc’ are proprietors of one of Skerries finest accommodation offerings, the White Cottages on the Balbriggan Road just past Hoar Rock. It would be impossible to live in Skerries and not have noticed this very pretty group of houses. They are not just near the sea - they are practically on the sea! Childhood sweethearts, Jackie and Joc hung out together in Skerries as teenagers before marrying in their early 20s and moving to the south side. “I suppose work led us to the south city’’, says Jackie, ‘’but really our hearts have always been in Skerries and we would return nearly every weekend to socialise and see our families!” When they were later blessed with children, a return to Skerries seemed like the obvious choice. Back ‘home’, they settled into family life pleased to be rearing their children where they both grew up themselves. Ironically now the White Cottages are on the very road that Joc lived on as a child. Jackie explains how the White Cottage was an idea she harboured for a while. Originally there was a garage on the site. 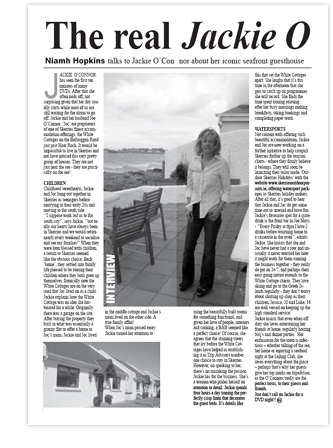 After buying the property they built in what was essentially a granny flat to offer a home to Joc’s mum. Jackie and Joc lived in the middle cottage and Jackie’s mum lived on the other side. A true family affair! When Joc’s mum passed away Jackie turned her attention tousing the beautifully built rooms for something functional, and given her love of people, interiors and cooking, a B&B seemed like a perfect choice! Of course, she agrees that the stunning views that lay before the White Cottages have helped in establishing it as Trip Advisors number one choice to stay in Skerries. However, on speaking to her, there’s no mistaking the passion Jackie has for the business. She’s a woman who prides herself on attention to detail. Jackie spends four hours a day ironing the perfectly crisp linen that decorates the guest beds. It’s details like this that set the White Cottages apart. She laughs that it’s this time in the afternoon that she gets to catch up on programmes she will record. She finds the time spent ironing relaxing after her busy mornings making breakfasts, taking bookings and completing paper work. Not content with offering such beautiful accommodation, Jackie and Joc are now working on a further initiative to help catapult Skerries further up the tourism charts - where they firmly believe it belongs. They will soon be launching their tailor made ‘Outdoor Skerries Holidays’ with the website www.skerriesoutdoorpursuits. ie, offering watersport packages to Skerries holiday makers. After all that, it’s good to hear that Jackie and Joc do get some time out to unwind and have fun. Jackie’s favourite spot for a quite drink is the front bar in Joe Mays - ‘’Every Friday at 6pm I love 2 drinks before returning home to a casserole in the oven’’, admits Jackie. She insists that she and Joc have never had a row and unusually it never worried her how it might work for them running the business together - they really do get on 24/7, and perhaps their easy going nature extends to the White Cottage charm. They love skiing and go to the Greek Islands regularly - they don’t worry about shutting up shop as their children, Jessica, 20 and Luke, 16 are well versed on keeping up the high standard service! Jackie insists that even when off duty she loves entertaining her friends at home, regularly hosting bbq’s and dinner parties. Her enthusiasm for the town is infectious – whether talking of the sea, her home or enjoying a seafood night at the Sailing Club, she loves everything about the place – perhaps that’s why her guests give her top marks on tripadvisor, as the O’Connors really are the perfect hosts, to their guests and friends. Just don’t call on Jackie for a DVD night! !